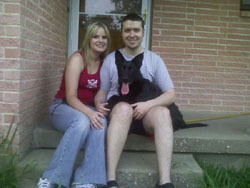 We purchased our first German Shepherd, Riley, from Gerdeshaus. Amanda and Jeremy made the whole process of buying and shipping a new puppy so easy, through e-mail updates, pictures, answering all of our questions etc. We described our lifestyle, family, and our personalities and they chose the perfect puppy for us. Riley is such a joy to have around, she is full of personality, extremely smart, and friendly to visitors. Its amazing that at only about 10 months old she is so protective of her family. Any time she hears some one at the door or a noise in the front yard, she barks and waits at the door until it goes away. Riley is so full of life and energetic, she's always ready to play frisbee, go for a walk, or go swimming. Thanks to Gerdeshaus we have an amazing addition to our family! 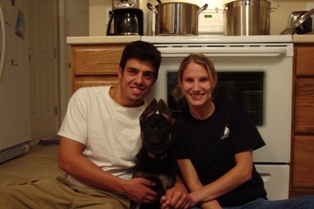 Amanda and Jeremy are so knowledgable and helpful, I wouldn't buy a German Shepherd from anywhere else but GERDESHAUS! 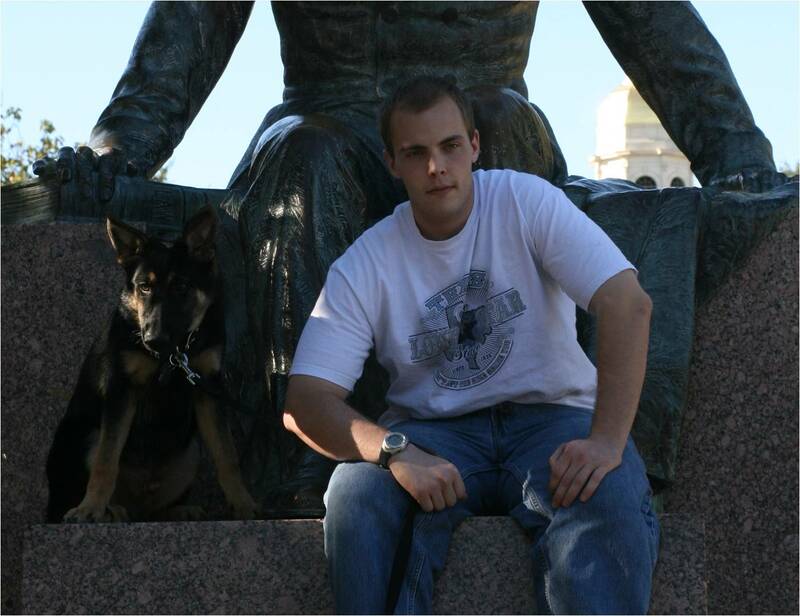 When I decided I wanted to get a German Shepherd puppy, my first concern was that I get a dog that I could trust around other people and children. I like to take my dog with me when possible so the dog has to be able to interact with people without being aggressive and without me worrying about biting. I did some reading and found that most of the behavior problems with German Shepherds has been due to poor breeding practices. With that in mind, I decided to search for a breeder that appeared to follow good a good breeding plan. 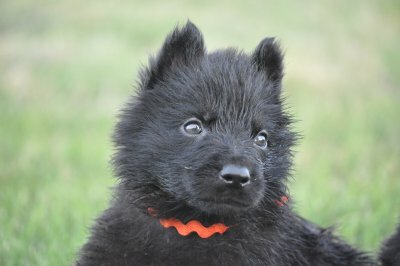 I was especially interested in a puppy with a European bloodline since everything I read indicated that the European breed had better personality and intelligence on a whole. I got "Gretchen" in May, 2010. When I got her home and began to observe her personality, it was clear that I got exactly what I was looking for and what I paid for. Gretchen has a very outgoing and friendly personality. I have had a Golden Retriever in the past and I would say Gretchen is absolutely as outgoing and friendly as he was. The German Shepherd is more confident and dominant than the Golden was but she is just as friendly. Gretchen has also proved herself to be quite intelligent. I began formal training at 4 months and even at a young age, she learned quickly. She has learned sit, down, place, heel, and come commands on or off leash. I am very happy with my decision to get Gretchen from GerdesHaus. Although there are cheaper puppies out there, I looked at it as paying for insurance that I would get the temperament and intelligence I wanted. Gretchen has definitely been worth the extra money. Let me start by saying I found Kuma while I was in Iraq. 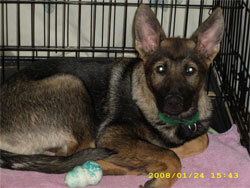 Gerdeshaus German Shepherds worked with me on my time schedule and cared for Kuma until I was able to return. On top of that they kept me well informed and that made all the difference in way of nerves. My boy Kuma has been wonderful. He really has a lot of drive and a ton of personality. He is highly intelligent, and is always eager to learn. I also believe whole heartedly that he enjoys learning new things too. He is very obedient, and acts out his commands with a hustle, especially if I have a ball or Frisbee in hand. Oh, and I feel the need to mention that from day one it has been easy to let him off leash, not once as he got to far or tried to run off... Kuma is just recently starting to get a little more protective around the house by letting me know when people are around, among other things (he's 7.5 months at this time). BUT with that being said, I have never had a single problem with his attitude or temperament. He's not skittish about anything. The noises that send my friends dogs running for the hills and hiding for their life do not even seem to get a second look from Kuma. He absolutely loves being around other dogs and people. He has incredible stamina and could easily run from sun up to sun down. He's a strong little devil and latches down on his tug like a vice and will only releases upon command. Kuma also does quite well in the house and crate/house breaking him was almost too easy. He has loads of personality and is extremely affectionate. He rarely misses a short trip around town. He loves the ride and waits patiently in the car while I run inside. We absolutely love the little guy and he's spoiled rotten on top of it. Never would I have it any other way. 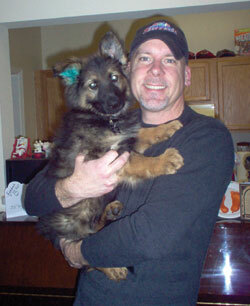 I highly recommend Gerdeshaus German Shepherds, and as soon as I am able, Ill be ill be in line for another one. Mayhem is an exceptional dog in many ways. Firstly, he is exceptionally intelligent. As a six month old pup he has already learned over 18 commands, ranging from sit, lay down, wait, outside, go to bed, among others. 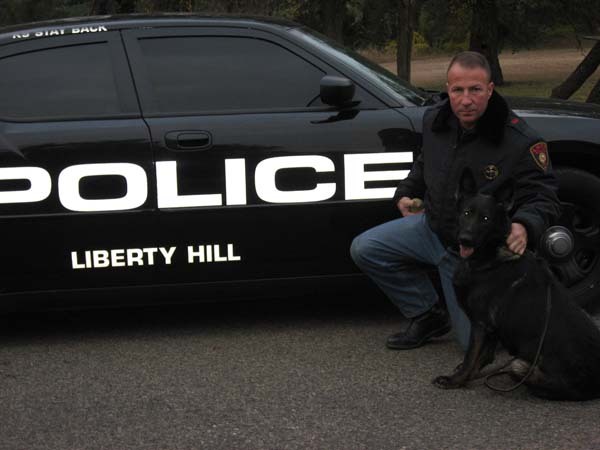 All these commands have been learned even before we have begun any of his Schutzhund training. Another manner in which Mayhem is exceptional is that he is exceptionally good looking. Every time I have taken him out on a walk around the Baylor campus or out for play in a Dallas dog park, Mayhem receives multiple compliments on his appearance from other dog owners, people on the street, people driving around, and even the police officers that patrol the campus. The third way in which Mayhem is exceptional is particularly astounding in that he has an exceptional temperament. He is a bold puppy, showing no fear of loud noises such as thunder, crashing sounds, or loud appliances. He is curious and explorative, taking great joy in partaking of new experiences in the many different environments I bring him to around the state, and amongst my military and civilian colleagues. Particularly exceptional is that he also extremely social. He absolutely loves other people and other dogs, and loves nothing more than meeting them, whether or not they reciprocate his feelings. It has been and continues to be a great pleasure to raise this pup and to see him mature into a great dog and companion, and I’d like to thank the folks at GerdesHaus for the opportunity to own such a great pup as Mayhem, and the care that they gave him in the first eight weeks of his life. Kikka is great. She is just over 6 months and weights in at 70 lbs. Every day we get compliments on how beautiful she is and I have given your name to several people that asked where we got her. 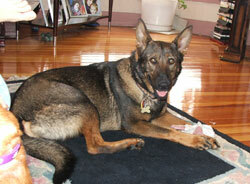 Kikka is very smart and easy to train, she learned to sit in about 2 minutes. The method you use for socialization works well. I have seen only one thing that she was wary of, that was the 1st time she heard thunder. Caius is a wonderful dog. He had no problems in adjusting to his new home. His first night here could not be more perfect. Kaiser and Brittany accepted right away. Thanks so much. We all love him. He is the perfect addition to our family. I just wanted to write you a short letter telling you thank you. My intention when I purchased Aska was to have a pet and a breeding partner for my work dog. Due to her being such a high quality dog I have already got her certified for cadaver recovery. My initial plan of breeding has happened, after I go through the puppy process, then I will continue her training in narcotic detection. You obviously have very good quality animals coming out of your kennel. Any way I really wanted to say thanks because you both are so helpful when I call with crazy breeding / puppy questions. You would think since I’m a canine officer I would know this, but my experience has only been with adult male dogs. Again thank you both for every thing. We've gotten him to sit and lay down within the first week. Sit took about 4 minutes and lay down took 3 days. He already knows that when he goes outside to use the bathroom, he gets a treat. Now he cries by the door goes outside and fakes peeing and comes inside, lays down immediately and then starts barking until he gets his treat. He had us figured out before we figured him out. amazing. I also can't keep him inside. He loves the rain. Now, he sits, lays, stays, shakes, and is fully potty trained. We're working on heeling next week. I timed him on learning to shake. It took exactly 3 min and 26 sec to get it down. Amazing. Thank you so much for Arkan Jr. He is beautiful and a amazingly intelligent dog. Everybody always comments on his looks and how beautiful and big he is going to be....he definitely keeps our lives interesting and we already love him to pieces. he is part of the family. his temperment is amazing. We had him at the vet and while she was checking him out she would not stop commenting on how calm he was and kept saying he was like a show dog. he keeps us very active, we go for long walks, run around in the backyard, he even went swimming with us the other day. hes great with people and kids already and loves other dogs. It's amazing though, when were out walking people stop and look at him like wow he is possibility the prettiest german shepherd i have ever seen. I actually see people in cars look with their awww faces at him. he loves us so much, he cuddles up on our laps when we sit with him and chews on his toys, but he also is not attention craving, if my wife and i want to have a relaxing night he can occupy himself for hours, just the fact that were around is enough for him. we have him in puppy kindergarten and he is the star, learns so quick, other people in the class are so jealous on how quick he learns and car rides, MY GOD!! from the first day we got him he has been amazing with car rides, he sits there, calm and quite, most of the time he actually sleeps, thats how relaxed of a dog he is. we couldn't imagine a better companion and its just the beginnning!!! thank you again so much for this amazing addition to our family. I am writing to endorse wholeheartedly GerdesHaus Kennels as superior breeders of German Shepherds. They are extremely knowledgeable about the breed and very careful about matching puppies to owners. I was impressed by their great love of the breed and the purity of the breeding lines. The temperments of their dogs are incomparable. I have been thrilled with my brilliant, gorgeous puppy, Kiiye. We have a trainer working with us now and she is so impressed with Kiiye that she demanded to know who his breeders were because his temperment, personality, and abilities are stellar. She has encountered a lot of German Shepherds in her training experience and finds Kiiye to be calm, accepting and anything but nervous or jumpy. My trainer said my breeders did a fabulous job and she is extemely impressed with Kiiye. He is learning so quickly and is so easy to train, that he is going to be able to enter the obstacle course and seach and rescue group that she organizes a little early. If you are looking for a quality German Shepherd, either for working, or as a pet, look no further than GerdesHaus Kennels. Jeremy and Amanda will let you meet the sire and dam, visit the puppies as often as you want and guide you every step of the way with advice, if you seek it. Their dogs are worth the price for the bloodlines and temperament, not to mention their intelligence and good looks. These are fabulous dogs, and quality breeders. Thank you so much for Bruno. I can’t imagine getting a better dog anywhere. He’s not all brawn, his looks are amazing. Everywhere I go, people come up to me and want to know more about him. He’s such a handsome dog. He’s a little over 4 months old and is progressing well. He knows where his potty area is in the yard. He knows how to sit, down, stay, wait and speak. He’s working on shake, situp and I think the skies the limit as to what he can learn. From the time I started talking to you, til now, everything has been perfect. I appreciate all your communication in getting him to Atlanta and for answering the many questions that I have both emailed and called you about. You guys have gone over and beyond to make sure that I had a good puppy and that I knew the right things to do with him. It was a little scary when I started looking for a pup. There are many websites and I also read some terrible experiences people have had in securing a puppy off the web. You’ve proven to be very good at both breeding and fulfilling all your obligations. I’m sending you this in hopes that you will post this on your website. 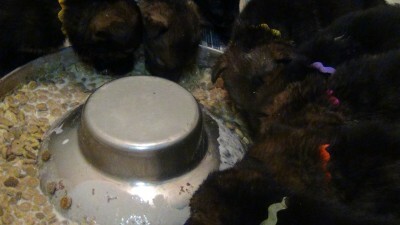 If anyone is hesitant about buying a pup from you, I can assure them that you breed top-line GSD’s. it was money well spent. I’ve never had a dog this nice and this smart. Take care and keep up the good work. I am so happy that I found ya’ll when I was looking for a puppy. I couldn’t have asked for more. I was very impressed with your knowledge and respect for the German Shepherd breed, and truly could not have found more responsible breeders. Diesel is the light of my life and I am so glad I was paired with him. He was and is everything I wanted in a dog from personality to build and color. Everywhere we go people stop and ask about him and comment on how he is such an intelligent and handsome looking dog. He truly has a spot light personality and is always putting on a show. Which is great for a full time stressed college student. He loves to go riding in the car and really enjoys his squeaking “bad cuzz” ball at 5am. He is fully crate trained and doesn’t have accidents in the house anymore, he behaves well on a leash and also knows his sit, wait, down, “bring it”, “kennel up”, come, here, and shake commands. He also waits patiently standing to put on his harness before we go on walks and willingly walks with me off leash without a problem. 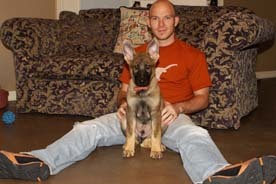 I’m excited to start working him in competition and look forward to his training in schutzhund with you as well. 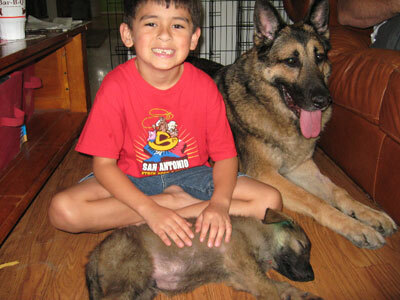 Diesel gets along great with other dogs and cats and is well socialized. Thank you so much for giving me the opportunity to own one of your dogs. I feel truly blessed that I found such great people, ya’ll have been there for every question I have had and every new puppy owner worry. It was truly a great experience working with you both to find me the very best puppy for me. He’s my little man, my little monster and the very best possible puppy I could have ever wanted. I will sing your praises to anyone who is looking for a great pup. Thank you so much for picking Micah and I out as Foster parents. 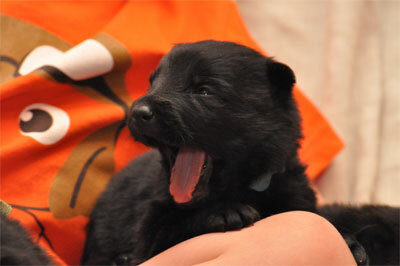 We cannot and could not be more elated with our purebred all black GSD. Onyx (Baroness from the "B" litter) is the smartest and most protective dog we have ever owned and gets along extremely well with "Sparky" our 11 lb Shih-tzu. Within one week after picking her up she would growl to let us know that the neighbors were outside. She is about 4 1/2 months old now and Onyx can already Sitz (sit), Platz without taking the treat all the way to the ground (lay down), Bleib (stay) in a sitz or platz for what seems like hours while we walk around the house, find my cell phone for me and we are working on my keys, Aus (drop it) perfectly, Lass es (leave it), Kennel up (find and go into her crate on command), wait in a sitz and bleib for her food, Heel, and fetch. She is just awesome! 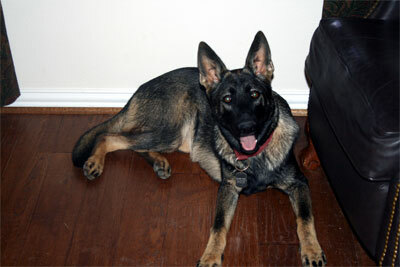 In fact, we are so happy with Onyx that I have decided to also invest in a male GSD from GerdesHaus Kennels. If he ends up being anything like Onyx I will be so blessed! Micah and I are completely sold on your dogs. I love to just come out to visit and see them. The are so gorgeous and smart! Thank you from Brook! She is very happy and healthy, she has gotten bigger I swear! She is such a love! Loves the car, get mad when I go to work because she cant go. Training is going well listens very well on the leash and in the house working on off leash training now. Using a training collar and doing awesome. She has become very protective while in the house, she even scares me when she goes at the door! LOL When we are out she is very friendly and good with people. We are all very happy. This is a great match! Hope all is well with you guys, and all the "babies" that you are expecting. 2 and 4 legged! Irene, PJ, Lexy, clyde, brooke, dominoe, and chantily.